It can be hard choosing from the myriad devices which crowd today’s smart home market. There are gadgets and systems of various calibre populating the internet marketplace as far as the eye could see (or as much as time will allow you to browse). Hive has entered the smart home market only last year but its products have already garnered a solid feedback base. In January the company launched a follow-up to its Active Home hub system, called Hive View. It is a camera device that monitors your home while you’re away and sends notifications in the event of intrusions. 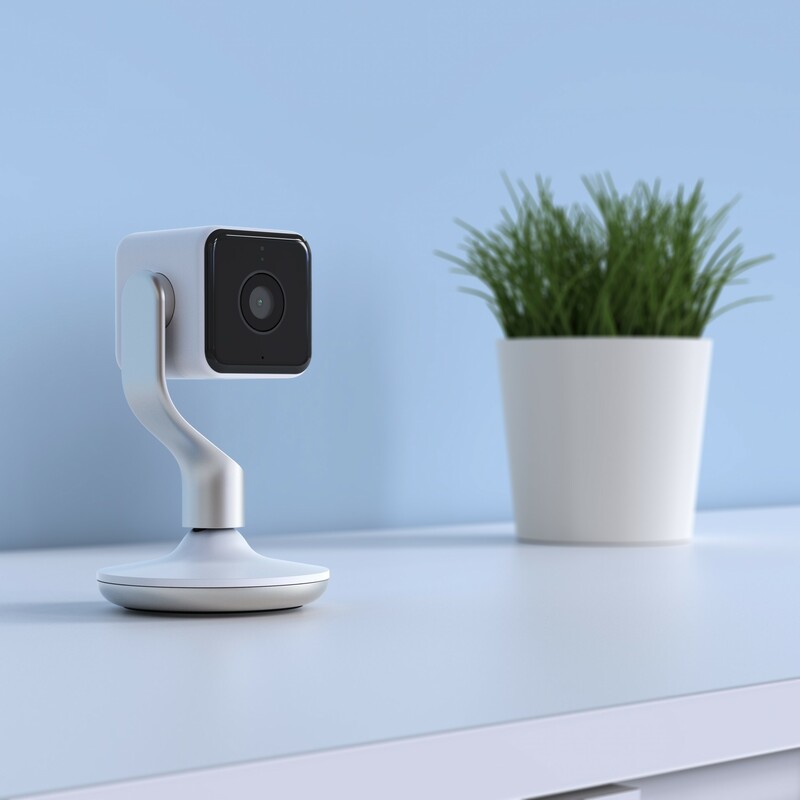 The camera boasts a 130-degree field of view, HD livestreaming and 24-hour playback – all accessed through Hive’s smartphone app: the central hub for all its smart home devices. Anyone that has operated a GoPro with the remote control app function will be familiar with the process. In an age where the human attention span is less than that of a goldfish, there is no tolerance for excruciatingly lengthy setup procedures. I was impressed with the simplicity of Hive View’s registration process, which only demands that you create an account on the Hive website in order to register the device for use with your smartphone. An email with a confirmation link is immediately sent out and just as simple as that, you’re ready to go. Once a Bluetooth connection has been established the camera will indicate it with a very Hal 9000-looking ring glow around the camera lens. The main aesthetic feature that gives the device its character is the stand. It’s smooth and slick and made of a sturdy metal that gives it good footing on any flat surface. Safe to say it won’t easily get tipped over or blown away anytime soon. A thing I found particularly nifty is the stand’s magnetic base. You can use it to secure the device to any metal surface either at an upright angle or in any position you see fit. Alternatively you can attach the base to a non-metal surface with screws that Hive were nice enough to provide in the box. One main characteristic of the device is the ‘Grab and Go’ feature. It gives the device freedom of movement by allowing it to be removed from the stand and placed anywhere around the home. As far as mobility goes it’s very thoughtful, and gives a static home recording device the freedom of a handheld camera. Another of the camera’s key features is the person-detection mode, which allows the device to save energy and storage by recording only when its triggered by a human entering its field-of-view. When I left the device on standby for a 24-hour period, it flawlessly captured every room entry throughout the day (and night – in the camera’s nightvision mode). Not only were all the recordings conveniently stored in the video log for playback but I received instant app notifications whenever someone entered my room with the chance to view them as they were, in real time, miles away. However, I did discover one flaw. The device would not always film for the entire time the subject was in the room, with most of the recordings averaging between twenty to forty seconds. Maybe it was the intention of Hive to capture only the detection itself and not waste video storage on trivial occupations, but it is slightly inconvenient if you want to look back through the whole footage and worse yet, if there was a home intrusion. However, overall I found the person-detection feature accurate 100 percent of the time and the Hive View is a pretty impressive piece of hardware that fits well into the company’s Active Home hub. If you’re concerned about intrusions or there’s a particular part of your home you’d like to keep an eye on, this nifty little gadget can offer a good solution. App users can toggle between 720p and 1080p video quality and for storage the company offers an addon to the free 24-hour playback option, which gives a 30-day rolling video history for €4.99 a month – part of the Hive Video Playback service. The going price for Hive View is €199 – or €339 for a double-camera pack. The company also offers a bundle package that includes Hive View and a variety of the company’s other home gadgets, starting from €19.99 per month. Is it worth it? Perhaps the more appropriate question you should be asking is: if I were investing in a home monitoring device, is this the one I should opt for – the answer to which would be yes. It’s a device just as good as any high definition monitoring system, with great features and functionality to boot. The modern design also means you don’t need to conceal it behind flower pots or ornaments like the majority of other home monitoring devices. Rather, you can flaunt its slick, flawless exterior from a desktop or bookshelf for all to see.